Poway Road Mini Storage (PRMS), one of seventeen facilities within the San Diego Self Storage (SDSS) family, has proudly supported the San Diego Humane Society. 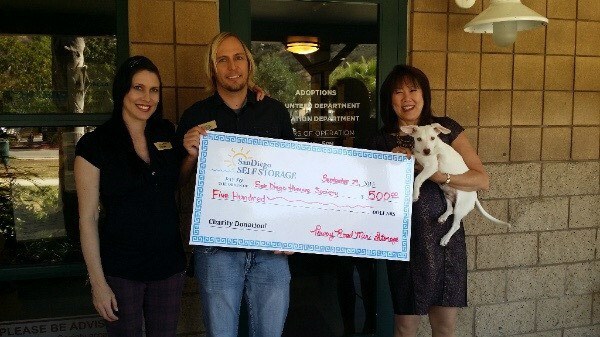 Poway Road Mini Storage Managers Steve and Tally met with San Diego Humane Society Director, Jean Russo and adoptable pup Ajax, to deliver a check for $500 dollars.. The donation is part of a charitable project for San Diego Self Storage staff. Each of the 17 facilities were given a sum to contribute to a local organization. The employees determine who receives the funds. “We chose this organization because we love our pets and want to help less fortunate animals that are suffering. We believe that all animals deserve a chance at a good life,” remarked Steve and Tally. “We are an organization of compassionate people who care about our community, and we hope to continue to make a positive impact in San Diego. Our charitable project works to involve our employees, to stress the value of remaining an active participant in the community,” said Director of Operations, Kraig Haviland.